In the upflow anaerobic sludge blanket (UASB) type of reactor, the gas/solid/liquid separation system is integrated into the vessel (Fig. 8.6). This reactor can only be used if large, dense, readily settleable particles are formed - a granular sludge which allows high concentrations of suspended solids between 20 g L-1 MLSS and 30 g L-1 MLSS (Lettinga and Hueshoff 1991, 1992). Fig. 8.6 Upflow anaerobic sludge blanket. The influent wastewater is distributed at the bottom by a system of tubes which provides a flow through a blanket of granular sludge. Inside these porous particles, fatty acids and biogas are formed. The reaction rate of the process is controlled by diffusion, convection and reaction inside the pores. 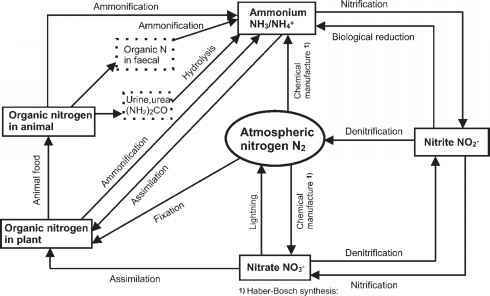 Ascending biogas bubbles keep the particles partially fluidized. 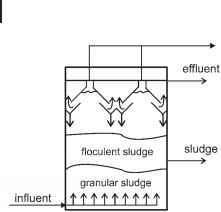 Depending on the kind of wastewater, the sludge tends to be more or less flocculating, which determines how well it is suspended in the fluidized sludge (Fig. 8.6). At the top of the UASB, the gas bubbles are separated from the water in hoods and the rising flocs which show a lower settling rate are carried up by the gas/liquid flow. Gas is collected in the hoods and removed. Liquid/solid separation takes place in the settler section. The treated water flows over weirs while discharging into a wastewater canal system for further treatment either together with municipal wastewater or directly by subsequent dedicated processes, such as aerobic purification. The mass of flocculent and granular sludge must be controlled by siphoning off excess sludge. Depending on the wastewater, hydraulic retention times of tR = 0.2-2.0 d are typical for a load of BV = 2-25 kg COD m-3 d-1 (Grady et al. 1999).